The whole world was watching as uprisings took place in Ferguson and across the US over the deaths of Michael Brown, Trayvonn Martin, Eric Garner, and many more. In the UK, the Black Lives Matter protests and die-ins were echoed, chanting the slogan “hands up don’t shoot” in solidarity. The United Families and Friends Campaign (UFFC) together with Defend the Right to Protest and the NUS Black Students’ Campaign brought Patrisse Cullors, one of the co-founders of the Black Lives Matter campaign, to London in February 2015 to tour across the UK. Following on from this, we were invited at the beginning of October to California for a #CaravanForJustice tour organised by the Ella Baker Centre and the American Civil Liberties Union (ACLU) that would allow us to tell and share our stories across Southern California. 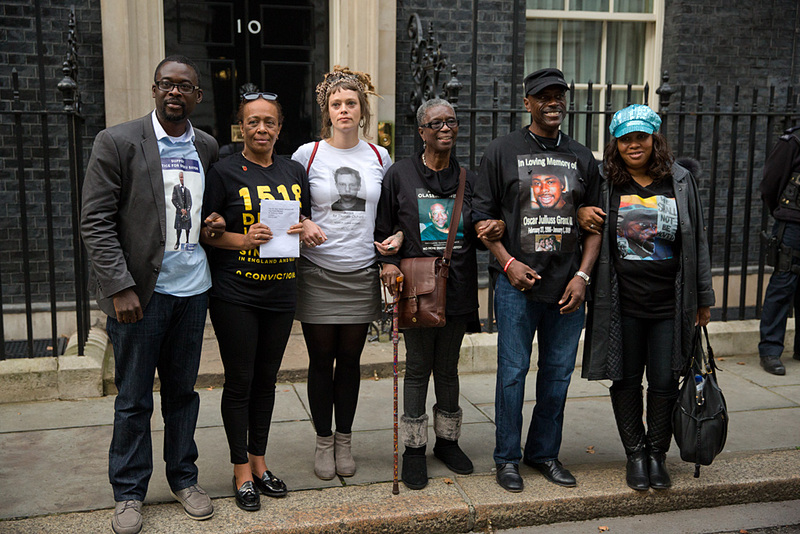 The trip was a vision that I had about 2 years ago as the chair of the United Families and Friends Campaign (UFFC), a coalition of UK families whose loved ones have died at the hands of the police and other government state officials, including the NHS, prison service and immigration units. I travelled with three other families: Stephanie Lightfoot-Bennett, the twin sister of Leon Patterson who was murdered by the police in 1992, Shaun Hall the brother of Mark Duggan who was shot by the police in broad daylight and whose death sparked uprisings in Britain in August 2011, and Kadisha Burrell-Brown whose brother Kingsley Burrell was killed by the police in a psychiatric unit. Together, we made the long journey across the Atlantic in a bid to start a global conversation on deaths in custody and state violence, as well as to bridge our struggles. From the beginning, the most surprising aspect of our trip was the lack of awareness amongst communities and activists in the US in relation to the UK context. Throughout our tour of California, we wore t-shirts highlighting the 1518 people who have been killed in police custody since 1990, with not one single conviction of officers involved. This statistic alone shocked everyone from passersby on the street to people we spoke to at rallies and community meetings. Importantly, it contextualized the issue as an international one. Beyond the horrifying figures, I witnessed the identical traumas and pain shared by US families who have also had their loved ones killed. Meeting at our first stop in Oakland the uncle of Oscar Grant, a 22-year old Black man shot dead by a police officer at Fruitvale BART Station on New Years Day 2009, was truly powerful. Cephus ‘Uncle Bobby’ Johnson inspired us with his family’s victory in having the state bring a successful prosecution against the officer that shot Oscar that night – a first in California’s history. The introduction of the new mobile app in California was also inspiring. An app that any witness can use to record if they see something wrong when the police interact with the public it serves, and the footage can be safely secured by just pressing a button that automatically forwards the footage to the ACLU to eliminate erasure by an officer. The app also lists your legal rights as a citizen. I am pleased that the app is also now available here in the UK called the Y Stop app. Everybody should download this app to their mobile. My brother, Sean Rigg lived a relatively normal life, he was a talented musician who had everything to live for. He also suffered from mental health issues. On 21st August 2008 he was extremely unwell and psychotic and was over-due his medication for two months. Erratic emergency 999 calls were made over a period of 3 hours by mental health staff at the hostel where he was living, so that he may be taken to a place of safety – a hospital. The police refused to come and eventually Sean went onto the street where members of the public could see that he was behaving bizarrely. Four police officers shortly after arrested him for theft of his own passport, public order offence and alleged assault on a police officer. Four years later, an inquest jury found that Sean was restrained in the prone position for a period of approximately 8 minutes, handcuffed in the rear stack position and transported in a deleterious position to the police station at speed. On arrival at Brixton police station he was kept in the police van for 11 minutes before being removed in a collapsed state and heavily assisted by police officers. Within seconds he is on the floor where it is captured on CCTV that he was clearly unwell. Surrounded by 5-6 officers in what was called the “caged” holding cell, Sean died at the officers’ feet within 45 minutes of him being arrested. Officers claimed he was being violent , wanted to sleep and that he was ‘faking’ fitting and unconsciousness. The inquest jury gave a damming narrative verdict, which found that the police officers’ actions or inactions contributed to his death, together with his mental health team as they could have prevented him becoming so psychotic at least a week prior to 21 August. Police officers were found to be lying on oath. Seven years later and after numerous reviews, legal challenges by the family and further investigations, the case is currently a criminal investigation by the Independent Police Complaints Commission into the arrest, restraint and detention of Sean. A Sergeant has been charged with a single count of perjury and his trial is expected in late 2016. The question is, why should families have to fight so hard to achieve justice and accountability? Over half the deaths in police custody in the UK are Black men with mental health issues. During the trip to the US, I heard countless stories about mental health and policing which appear almost identical to those in the UK. It was chilling to hear the similarities – smear campaigns against the families and their loved one; officers falsely claiming that our loved ones had a gun or had super human strength to justify their actions; officers being allowed to collude their statements of facts; mental health patients and the homeless targeted as criminals; the lack of disclosure of evidence and treatment to families; the repetition of the lack of duty of care, the lack of accountability and justice…and the list goes on. I do not believe this a coincidence. It was an emotional roller coaster listening to real life stories from people in Oakland, Sacramento, Stockton, Fresno, Salinas, Riverside, Orange County and Los Angeles. One of the families was a young man in Sacramento, who had been shot by the police multiple times. Amazingly, he lived. A bullet was still lodged in his back and I could feel it. His leg was in a brace and he had scars on his chest and arms where he had been shot. It was painful for all of us to see his mother in such turmoil who described her son drowning internally from his own blood and that each bullet was like being on fire. The trip was truly one of the most empowering experiences. There was such warmth and inspiration from all those we met. Their fight for justice is an on-going struggle, just like in the UK. Families have no choice but to continue their fight for justice for their loved one. Black lives on both sides of the Atlantic appear to mean nothing and there is a remarkable dis-proportionality of deaths. Obviously, all lives matter for we are all human no matter your colour or race. However, for Black people, the apparent war on black and brown men is nothing more than modern day lynching. It is imperative for all future generations to keep campaigning for justice and to challenge any violations of human rights wherever they manifest. We must continue challenging against police brutality on a global level, as well as locally. Families and supporters from across the UK unite and meet annually in remembrance of their loved ones at Trafalgar Square and march to Downing Street to hand in a letter of demands. This year marked the UFFC’s 17th Remembrance Procession. Cephus Johnson, affectionately known as ‘Uncle Bobby” and his wife Beatrice, travelled to the UK and attended the UFFC remembrance procession on 31st October in solidarity with the families. Their presence was historic for UFFC. It is important for families globally to unite in solidarity, share their experiences and have conversations on how to bring awareness to the world of the injustices families receive. Collectively, we have strength and hope in trying to bring real effective change for our future generations. Until there is justice, how can there be peace? Marcia Rigg, Stephanie Lightfoot-Bennett, Kadisha Burrell Brown, Wail Qasim, Janaya Khan #BlackLivesMatter Toronto, who all took part in the #CaravanForJustice, will be discussing experiences and lessons for campaigning against UK deaths in custody. They will be joined by Natasha Dhumma from YStop.